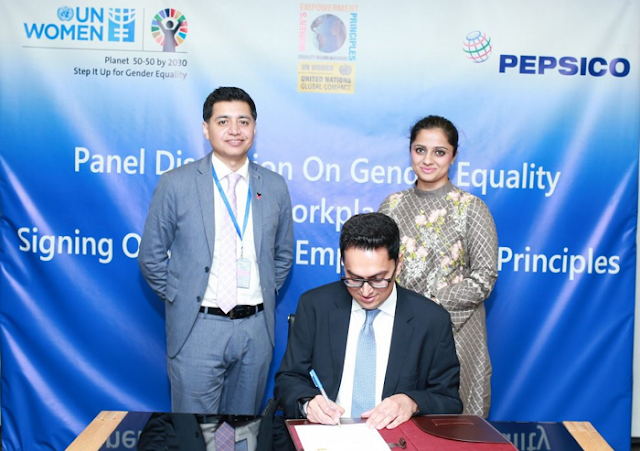 PepsiCo Pakistan signed on to the Women’s Empowerment Principles, a joint initiative of UN Women and the UN Global Compact. These Principles provide a set of considerations to help the private sector focus on key elements integral to promoting gender equality in the workplace, marketplace and community, through policy and action. Gender parity is a cornerstone of PepsiCo’s robust diversity and engagement agenda as well as its culture. In fact, PepsiCo leverages diversity and engagement as a competitive business advantage that fuels innovation and fosters engagement with employees and members of the communities in which we do business. By signing on to the seven steps of the Women’s Empowerment Principles, PepsiCo takes a global approach to four key areas: promoting economic development through female entrepreneurship, championing gender diversity in business and corporate level, public-private partnerships for advancing women’s economic opportunities and providing potential business and investment opportunities through supplier diversity and marketing practices. PCI was one of the first multinational companies to set up operations in Pakistan. Since commencing its beverage business in the country in 1967, it has grown to be one of the largest consumer goods producers in Pakistan and a market leader in refreshment beverages and snacks. The PCI System including its bottling partners and snacks portfolio directly employ over 15000 individuals while over a million are also indirectly associated with the business. The latter includes retailers, distributers, suppliers, transporters and farmers. With an increasing economic footprint, PCI plays an integral part in the economic growth and prosperity of the nation. PCI’s beverage FOBO (Franchise Owned Business Operations) business operates through its valued bottling partners, which manufacture and sell high quality and leading PepsiCo beverage products such as Pepsi, Mountain Dew, 7 Up, Sting, Mirinda, Slice and Aquafina. PCI’s snacks COSO (Company Owned Snacks Operations) business, which was launched in Pakistan in 2006, now features globally renowned brands including Lays, Wavy, Cheetos, Kurkure and Quaker, which have established themselves as favorites with the Pakistan market. Pakistan is one of the few markets which have the distinction of exporting locally manufactured snacks to over six countries including Malaysia. Since 1967, the PCI System has made significant investments in the form of a beverage concentrate plant in Hattar, beverage manufacturing plants nationwide and state-of-the-art snacks manufacturing facility at the Sundar Industrial Estate in Lahore. The Pakistan business ranks in the top ten global markets for PepsiCo.